Why magnets are ideal for promotions and souvenirs? Price : Low price with great impact, this is what you would like to achieve, isn't it? Long lasting impact : People stick this on the fridge for the life of the fridge. Optimum awareness : How often do we open the fridge? Usage : People use it for memo holder on the fridge or any metal surfaces. Magnetic properties : Our permanent magnetic material has high intensity lines of magnetic polarity which generate optimum holding power. Inks : Environmentaly friendly inks with heavy metal contents meeting EU limits. Report is available upon request. Lead time : Only 5 days for sample, production as short as 2 weeks. Flexible packing : Bulk pack, unsealed polybag, sealed polybag, food grade safe polybag, header polybag or display box. 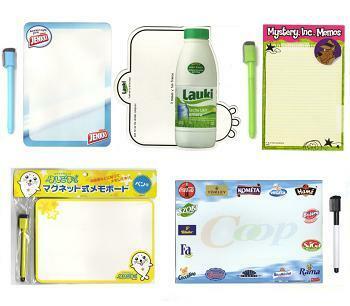 Products : A wide variety of products for you to choose to fit your promotion campaign. Copyright © 2010 Qualita Magnetics Ltd. All Rights Reserved.